Sleep disorders such as obstructive sleep apnea not only leave you feeling exhausted, they can also increase your risk for serious conditions such as stroke and heart attack. We can help! Whether you’re experiencing sleep disruptions such as obstructive sleep apnea, chronic snoring, or TMJ pain, a customized oral appliance from our sleep dentistry services can help treat your condition and restore your sleep. ​You’re in good hands at Sleep Easy Dentistry: Dr. Osborne has been practicing sleep dentistry longer than just about anyone in the San Antonio area. His expertise combined with that of our two highly trained medical nurses means that we can deliver quality care personalized to your needs. ​At Sleep Easy, we don’t treat generic patients -- we treat individuals! We customize our treatment of obstructive sleep apnea, snoring, TMJ pain, and other sleep breathing disorders to each patient’s unique needs. From your very first consultation with our office, our team will take the time to conduct an in-depth review of your health and answer your questions about sleep apnea. We offer free consultations at three convenient locations across San Antonio, Texas. What can i expect during my sleep easy consultation? At your consultation, you will meet with one of our medical nurses to discuss the symptoms you are experiencing and your current sleep quality. We will gather information about your sleep habits, your health and medical history and your lifestyle. Our qualified team will also conduct a thorough examination of your oral anatomy and your airway. We will also discuss some of the causes of sleep apnea and answer questions you have about your sleep quality. At Sleep Easy Dentistry, we use advanced dental and medical technology to diagnose and treat our patients. We use our CT ConeBeam machine to build a comprehensive 3D picture of your airway. Expert Oral and Maxillofacial radiologists at BeamReaders review these images and allow us to determine the best treatment for your sleep apnea. We also have close referral relationships with other sleep medicine and sleep dentistry providers to assist both in diagnosis and treatment of sleep apnea. If Dr. Osborne determines that a mandibular advancement device is the correct treatment for your sleep apnea, our team will work to create a customized oral appliance for you. These comfortable, portable oral appliances function like sleep apnea mouth guards as they treat your condition. Worn while sleeping, oral appliances gently shift the position to treat breathing issues associated with sleep apnea. ​While other sleep providers may offer just one or two options, we carry a variety of oral appliances at Sleep Easy Dentistry. This allows us to consider multiple factors as we select the perfect appliance to treat your unique condition. An oral appliance can treat sleep apnea. Photo courtesy of Prosomnus Sleep Technologies. Are Oral appliances an alternative to cpap Therapy? 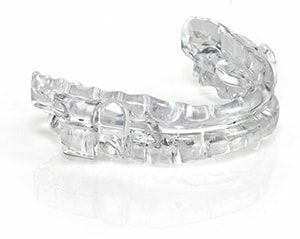 While CPAP (continuous positive airway pressure) therapy is commonly used to treat sleep apnea, a customized oral appliance from Sleep Easy Dentistry may be a great alternative for you or your loved one. In fact, many users of CPAP therapy find their CPAP machines uncomfortable and do not wear them as recommended! While an oral appliance may not be the right fit for every patient with obstructive sleep apnea, our team can help you determine your options. Call us today to learn more! What Kinds of devices do we use to treat sleep apnea? Over the last few years, the types of oral appliances on the market have increased dramatically. Health professionals and scientists are using advanced dental technology to create new treatment options that are more effective and more comfortable than ever before. The appliances we customize for our patients at Sleep Easy Dentistry can be distinguished by both their material and their mechanism. Some devices are created from a denture-like hard acrylic, some from a soft thermoplastic, some are a hybrid, and others use metal reinforcement. Devices also vary by the type of propulsion system used to hold the jaw forward: different appliances use traction, compression, midline traction, and interlocking systems. For a closer look at the oral appliances we use to provide individualized sleep apnea treatment, click on the photos below!